This is probably the most low-tech attraction in Tokyo Disneyland. 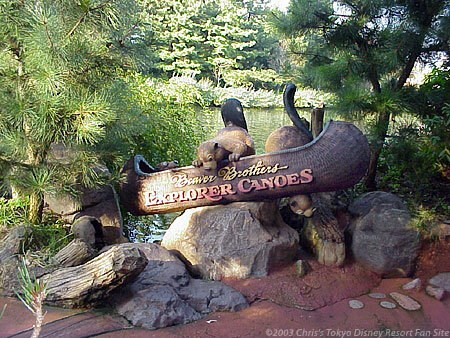 Beaver Brothers Explorer Canoes—I love the name—let you, along with about 18 other people, paddle a real canoe around the Rivers Of America. There are two guides on board who handle the steering of the boat, but most of the propulsion is provided by the guests. Just before boarding, you're provided with a paddle. After loading into the canoe, the lead guide (who sits in front) teaches you how to use it. It's not particularly difficult, although you'll probably bump the paddle of the person in front or in back of you a few times trying to get in synch with everyone else. Everyone stops for a quick break from paddling at several spots on the trip. This not only gives people a break, it also allows a chance to look around at some of the sights along the river. The lead guide gives some humorous descriptions of what you're seeing along the way, although he's speaking in Japanese. The canoe ride sounds like it might be more work than it's worth, but it's actually a lot of fun especially on hot summer days. If you want to simply ride around the river and enjoy the view, the Mark Twain Riverboat follows the same path as the canoes and requires no active participation on your part.